Global drug discovery services market expected to generate around USD 20.29 billion by 2025, at a CAGR of around 11.9% between 2019 and 2025. The rising expenditure on research and development, growing inclination of pharmaceutical companies toward outsourcing to evade hurdles driving the market growth globally. The report covers a forecast and an analysis of the drug discovery services market on a global and regional level. The study provides historical data for 2016, 2017, and 2018 along with a forecast from 2019 to 2025 based on revenue (USD Billion). The study includes drivers and restraints of the drug discovery services market along with the impact they have on the demand over the forecast period. Additionally, the report includes the study of opportunities available in the drug discovery services market on a global and regional level. In order to give the users of this report a comprehensive view of the drug discovery services market, we have included competitive landscape and analysis of Porter’s Five Forces model for the market. The study encompasses a market attractiveness analysis, wherein all the segments are benchmarked based on their market size, growth rate, and general attractiveness. The report provides company market share analysis to give a broader overview of the key players in the drug discovery services market. In addition, the report also covers key strategic developments of the market including acquisitions & mergers, new product launch, agreements, partnerships, collaborations & joint ventures, research & development, and regional expansion of major participants involved in the drug discovery services market on a global and regional basis. 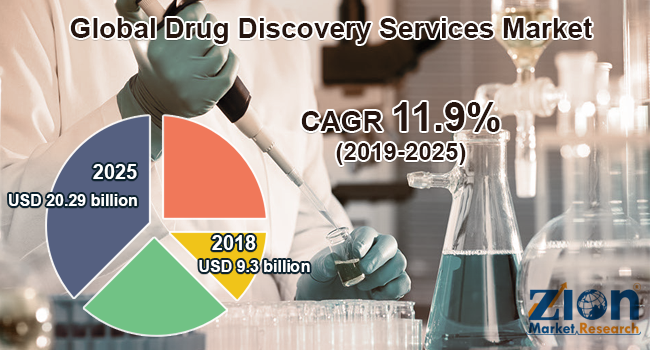 The study provides a decisive view of the drug discovery services market by segmenting the market based on type, process, drug type, therapeutic area, and region. By type, the drug discovery services market is segmented into pharmacokinetics and drug metabolism, biology services, and medicinal chemistry. The process segment includes target validation, target selection, hit-to-lead identification, candidate validation, and lead optimization. The drug type segment includes biologics and small molecules. The therapeutic area segment includes neurology, diabetes, oncology, respiratory diseases, cardiovascular diseases, and others. The regional segment includes the current and forecast demand for North America, Europe, Asia Pacific, Latin America, and the Middle East and Africa with its further segmentation into major countries including the U.S., Germany, France, UK, China, Japan, India, and Brazil. Some key players of the global drug discovery services market are Albany Molecular Research Inc. (AMRI), Thermo Fisher Scientific, Evotec, Charles River Laboratories International, Domainex, Covance, GenScript, Selcia Limited, WuXiAppTec, Viva Biotech, Pharmaceutical Product Development, LLC, and SRI International, among others.